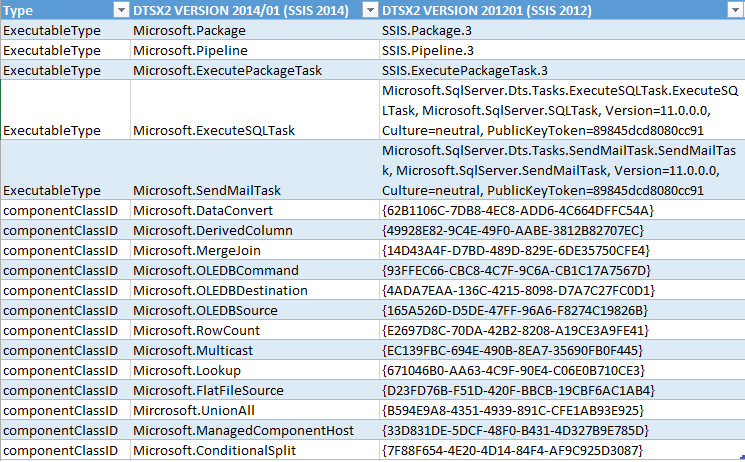 Based on my observation (only Microsoft can verify), excluding the upgraded components, there are three changes between the XML files of SSDT-BI 2012 and SSDT-BI 2014 dtsx packages. Have you guessed the fix already? You got it! It’s only a matter of find (all) and replace! Open the dtsx file in your favorite text editor (mine is Notepad++) and replace the values used in the DTSX2 Version 2014/01 schema with the ones in DTSX Version 2012/01 schema. 🙂 Now, there is some “manual labor” required, because you have to manually search for the componentClassIDs and ExecutableTypes in the DTSX Version 2012/01 schema. Here are the ExecutableTypes and componentClassIDs I encountered so far. Click Replace.xls for an Excel version. for the correct ExecutableType. For example, Microsoft.ExecuteSQLTask in SSIS 2014 should be Microsoft.SqlServer.Dts.Tasks.ExecuteSQLTask.ExecuteSQLTask, Microsoft.SqlServer.SQLTask, Version=11.0.0.0, Culture=neutral, PublicKeyToken=89845dcd8080cc9 in SSIS 2012. Replace ALL instances (including CreationName attributes) of the componentClassID value with the one from Step 10. Now open the package in Visual Studio 2012. If your package does not have upgraded components, then it should open by now. Otherwise, read further. Some components, such as the Script Component in the Data Flow Task, have been upgraded from SSDT-BI 2012 to SSDT-BI 2014. In this case, it’s not only the property / attribute value that is different, but also the structure of the XML node. In this case, replace the Version 2014/01 schema value (e.g. componentClassID=”Microsoft.ManagedComponentHost”) with any valid DTSX Version 2012/01 componentClassID. Then open the package in VS 2012. The component will be marked as with error, that’s OK. If you have followed all the steps above, your package should at least load the designer by now. Now remove this erroneous component and re-do it in VS 2012 itself. I was able downgrade SSIS 2014 to SSIS 2012 packages by modifying the XML file manually. I downgraded 15 packages in 4 hours including finding the workaround described above. It should be faster if you already know what to do. This approach seems more reasonable than re-creating all the packages I designed and developed for weeks with all their DFTs and expressions. No, thank you. Let me know if you encounter any other exceptions or if any of the steps above is not clear.